BERKELEY, Calif. ““ Judaism is a harsh, exacting faith condemning rebellious children to death by stoning. Islam exhorts Muslims to kill non-believers. Neither statement, according to many Jewish and Muslim scholars, is true. But they are among the most persistent charges laid at the feet of Judaism and Islam by those who are unfamiliar with the basic holy texts of the other’s faith. Hampered by such ignorance, how can Jews and Muslims engage in real interfaith dialogue? A new graduate-level course in Berkeley, billed as the first of its kind, aims to rectify this failing, at least for the 40 or so students enrolled. “Madrasa/Midrasha: Muslim-Jewish Text Study,” a nine-week course spearheaded by the Progressive Jewish Alliance and run by the Center for Jewish Studies and the Center for Islamic Studies of the Graduate Theological Union, introduces students of both faiths to the methodologies and foundational content of the Koran, Torah and Talmud. Each session is co-taught by a Jewish and a Muslim scholar. The course also is open to the public. The field of Jewish-Muslim dialogue and engagement is growing fast. According to a not-yet-published survey by the Center for Muslim-Jewish Engagement in Los Angeles, 13 of 18 groups involved in this work were launched in the past seven years, and six of them in the past two years. The new Berkeley program stands out from the pack by its focus on rigorous text study. While 50 percent of the interfaith groups surveyed indicated they would like to do comparative study of sacred texts, experts in the field say very few actually engage in such work beyond one workshop, and none do so at the graduate level. “This Berkeley program is very special,” says Rabbi Reuven Firestone of Hebrew Union College-Jewish Institute of Religion in Los Angeles, which two years ago partnered with the University of Southern California and the Omar Ibn Al-Khattab Foundation to form the Center for Muslim-Jewish Engagement. 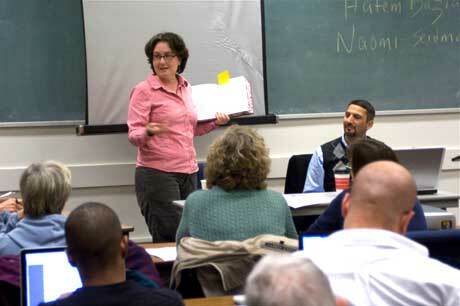 In January 2009, Firestone co-taught the text study section of a pilot program in joint text study and interfaith relationship-building run by the center and NewGround: A Muslim-Jewish Partnership for Change. The joint text study was conducted similarly to the new Graduate Theological Union course, although it was not part of a graduate level program. The center is looking for funding to replicate the course for other institutions. Neither Firestone nor organizers of the Berkeley course know of similar initiatives elsewhere. Instructors in both courses say that bringing together adherents of both faiths in text-centered dialogue defuses some of the tensions that typically crop up in interfaith groups by focusing attention in a third direction: the page of a book. “The experience of reading a Torah story we know as it appears in the Koran, seeing where it overlaps and differs, is very moving,” Firestone says. “It elicits questions. Your dialogue partner becomes the representative of a deeply fascinating religious tradition” rather than someone you’re trying to persuade of the rightness of your cause. At the Berkeley course’s first meeting Feb. 2, Professor Naomi Seidman, director of the Center for Jewish Studies at GTU, shows the class a page from Genesis, demonstrating how one line of Torah might be surrounded by pages of commentary. “The Torah is always read through the lens of rabbinic literature,” she explains. Flipping to Exodus, she reads the Hebrew, “Ayin tachat ayin,” and continues in English, “an eye for an eye, that’s the ‘proof text’ that the God of Israel is a vengeful god.” In fact, she points out, Judaism never understood that dictum literally, but follows the Talmudic interpretation that such crimes demand appropriate monetary compensation — an interpretation that is at the root of contemporary tort law. Hatem Bazian, a senior lecturer in Near Eastern and Ethnic Studies at the University of California, Berkeley, and Seidman’s co-teacher for the night, provided similar insight into the Koran, believed by Muslims to be the word of Allah as revealed to his prophet Muhammad. Muhammad had four main functions, Bazian begins — prophet, head of state, judge and military commander. One cannot understand a passage from the Koran without determining in which function Muhammad proclaimed it. If he was speaking as a prophet, the ruling has universal applicability, whereas if he was speaking as a judge, it might apply only to the case before him. Misapplying such rulings can lead to grave wrongs, Bazian suggests, such as nation-states that don’t protect the rights of all citizens. Munir Jiwa, founding director of the GTU’s Center for Islamic Studies, says that when Jews and Muslims explore their sacred texts, they discover deep bonds of intellect and faith — for example, shared assumptions about the primacy of religious law that is absent from Christianity. This can bring them closer as two minorities in a Christian-dominated culture. When Bazian discussed an Islamic ruling on ablutions after touching one’s genitalia during the first evening’s class, the Jewish students “didn’t think it was weird,” Jiwa points out, because Judaism, too, regulates bodily functions via religious rituals. Her friend and fellow doctoral student Uzma Husaini agrees.